The process was very easy, and the team is accessible. Questions are answered in a timely manner. Clean, great location, and incredible view. Everything was very easy and accommodating. Emails were responded to promptly and any questions I had were answered quickly. The house/condo was perfect! The location was amazing. It was cozy, relaxing, comfortable, and had everything needed to be able to cook a meal. It was great! Loved being able to check in and check out via the key box. The location was great! The beach was just across the street. I had no issues and A1 team answered all questions. location, the view, and the home was warm. We received a prompt response when requesting our booking. A1 sent the check-in information as promised. The property was identical to the photos. The decor was modern with a coastal feel. The condo was immaculate. The oceanfront view was breathtaking. We are looking forward to staying again real soon. Our experience working with A1 Property Management team was 4+. They are very professional and gave 'easy-to-understand' instructions prior to our arrival and expectations for checking out. Leaving Ohio with three inches of snow, we loved the condo with the awesome oceanfront view and 60 degree weather. In the mornings we enjoyed drinking coffee while watching the early morning surfers. The condo was well accommodating for four of us and we had room for even more. While it definitely was too cold for swimming in the ocean or catching some sun, we loved the indoor pool and spa! We would highly recommend this property and A1 Property Management! We hope to return to this property. When we had a slight issue with our rental we left a message after hours and we were pleasantly surprised that they contacted us within two hours. They were willing to come the next day to fix this issue. The location, cleanliness, the great remodel of the property, and just the feeling of comfort. Great property, condo access, home information, and local attraction / restaurant recommendations! Awesome location! Quiet, relaxing, and RIGHT ON the ocean! I'll never get used to hearing the sound of the waves, and watching the moonrise every night. Absolutely gorgeous! 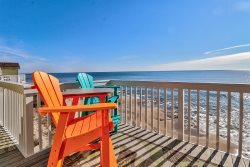 Carolina Beach is an amazing low-key beach community, and the property was perfectly appointed -- loved the floors, updated appliances, gorgeous kitchen (great backsplash and details i.e. cabinet knobs). When we called the office with a small problem with the bathtub fixture, our concern was addressed immediately. We were told exactly when the plumber would arrive, and he was prompt and efficient. We barely noticed he was there. We've stayed in this condo in years past, and each time we realize what a pleasure it is to have found this property. Few things are more wonderful than spending time during the off season at the beach. Because of the virtual wall of windows in the living room, we enjoyed watching the ocean even on the few days when the winds and cold kept us indoors. When the temperatures hit the mid-70s, we took full advantage of the large deck, sunbathing in the morning and eating breakfast and lunch outdoors. We enjoyed the new ocean-front Trex-style decking and wish the back street deck had the same flooring. The new ocean-front slider looks and works great but lacks a screen to let in ocean breezes when the temperatures are still cool but the bugs are out. The screen on the master bedroom slider is missing. The kitchen is well stocked, and the refrigerator and dishwasher are new. It took us a while to adjust to the electric cooktop, but the stove and oven worked well. One of the great pleasures of staying at the beach is buying fresh seafood and cooking it at home. Staying a month as we did means we need a decent washer and dryer, and the commercial-grade units in this condo work like a dream. The location of the condo isn't too close to the boardwalk or too far to walk to local restaurants. In the off-season, there usually aren't many neighbors in the building except for some weekenders, so it's relatively quiet and peaceful. Thank you for being so accommodating, enjoyed working with you. Hopefully we can call on you again next year. Enjoyed the condo. Everything we needed was at our fingertips including dishes, glasses, silverware, pots and pans and baking utensils. Very much appreciated as I enjoy cooking. Walking the beach everyday was a great escape. Thank you. The view! The amount of space served us well, the high ceilings and natural light were awesome. Pleasant. No problems at all. Right on the ocean with wonderful view of sunrise and super moon. Easy booking and David and team very responsive to our questions as this was our first time renting a condo. Beautifully decorated, fresh paint, floors etc. We loved it!!! Perfect place & perfect location!! Restaurants,shopping and boardwalk are all close by. The deck is spacious and super private. Trust the pictures...the beautiful photos that you see are exactly what the place looks like. I used their website to book and had no problems. The emails gave clear instructions regarding check in and check out. This condo is really cute. Close to the boardwalk but far enough to not hear it! The views, elevator and indoor pool were enjoyed by all. Wife and I like to come down during the winter months. We were pleasantly surprised with the ease and helpfulness of everyone we spoke to at A1. Well stocked, clean, comfortable, quiet. Pleasant to work with, very knowledgeable about the local things to see and do. The use of the recreation center was a huge plus! Nicely decorated.